This case is not an exception, it is a symptom of a more common trend that diversity managers and consultants often meet with. Diversity is so far away for business managers that it won’t play any role in their business considerations. Their first association when confronted with diversity initiatives in the organisation lies on a personal, moral level. They usually think that it is an interesting discussion from a societal point of view but it has no relation whatsoever with their aims or results. 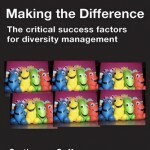 > The challenge is to match diversity with what managers see as their ambition. It is of vital importance that (top)managers have a clear and unequivocal vision on diversity policy concerning their business goals. Diversity policy is usually a long term strategy and moreover demands a certain investment. Probably this subject will disappear from the agenda slowly and unnoticed, or it will be overshadowed by other priorities. Therefore organisations need a clear phrasing of the need for a diversity policy. To develop a vision for your own organisation you must be fully aware what interests are related to diversity initiatives and what reactions, like the one in our case above, will be met with. If you want to start a discussion in your organisation to develop a vision for diversity that can be implemented, you better know what are the trends in the way organisations deal with diversity, including the consequences. That will save you a lot of time, because you can lay your finger more easily on the different assumptions that lie underneath the discussions. Is it about justice or about business interests? Chapter 1 of my book elaborates these different approaches of diversity worldwide while showing concrete examples from different countries. It gives tools how to handle a case like above and a format for the steps to be taken to turn diversity into a business case. Good luck while reading it and if you have any comments: they are welcome, let me know! Diversity in hotels: it exists in Stockholm! This entry was posted in Culture and diversity, Diversity Shop, Seba cultuurmanagement and tagged business case, diversity by wordpressgrethe. Bookmark the permalink.